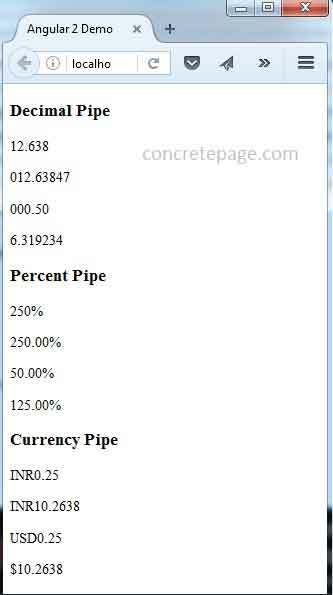 On this page we will provide angular 2 Decimal Pipe, Percent Pipe and Currency Pipe example. These angular API belong to CommonModule. Decimal Pipe formats a number as decimal number. It uses number keyword. Percent Pipe formats a number as percentage. It uses percent keyword. Currency Pipe formats a number as currency. It uses currency keyword. Decimal Pipe, Percent Pipe and Currency Pipe work on the basis of locale rules. These pipes have default format and we can also provide our own format. These pipes use the internationalization API which is not yet available in all browsers and may require a polyfill. Here on this page we will provide Decimal Pipe, Percent Pipe and Currency Pipe example step by step using typescript. DecimalPipe is an angular Pipe API and belongs to CommonModule. DecimalPipe is used to format a number as decimal number according to locale rules. It uses number keyword with pipe operator. Find the syntax. Finally we get a decimal number as text. Find the description. number_expression: An angular expression that will give output a number. number : A pipe keyword that is used with pipe operator. digitInfo : It defines number format. Now we will understand how to use digitInfo. The syntax for digitInfo is as follows. minIntegerDigits : Minimum number of integer digits. Default is 1.
minFractionDigits : Minimum number of fraction digits. Default is 0.
maxFractionDigits : Maximum number of fraction digits. Default is 3. Now find some sample examples. Now find a number that will be formatted. We will observe that fraction digit has been truncated to count 3, because maximum fraction digit is only 3. Now find the number that will be formatted. In our number, integer part is 12 that is of 2 digits, so adding 0 as prefix, it has been of 3 digits that is 012. This is because minimum integer digit required is 3. Now find the component used in our example. Angular PercentPipe is an angular Pipe API that formats a number as a percentage according to locale rules. It belongs to CommonModule. Find the syntax. percent : A pipe keyword that is used with pipe operator and it converts number into percent. digitInfo: It defines a percentage format. We have described the use of digitInfo in DecimalPipe section. It is used with following syntax. Now find a number that will be changed into percentage. Now find the number that will be changed into percentage. We will observe that there is two digits in fraction part. This is because minimum fraction digits required is 2. CurrencyPipe is an angular Pipe API that formats a number as currency using locale rules. It belongs to CommonModule. CurrencyPipe uses currency keyword with pipe operator to format a number into currency format. Find the syntax. number_expression : An angular expression that will give output a number. currency : A pipe keyword that is used with pipe operator. It formats a number into currency format. currencyCode : This is the currency code such as INR for Indian rupee, USD for US dollar. Default is USD. symbolDisplay : Default is false. But if we assign true then it will display currency symbol such as $ for dollar. digitInfo: It defines a currency format. We have described the use of digitInfo in DecimalPipe section. It is used with following syntax. Now find a number that will be changed into currency.